X-ray powder Diffraction is a technique used to determine the crystallographic structure of natural and synthetic materials. A beam of monochromatic (single wavelength) X-rays are focused on to the surface of a finely powdered sample. The X-rays are scattered (diffracted) as they interact with the sample material, the angle of which is characteristic of the crystal lattice of the material analysed. By rotating an X-ray detector around the sample the angle and intensity of the resultant diffracted X-rays can be measured allowing for the identification of the mineral(s) present. A Siemens D5000 Diffractometer (XRD) theta-2 theta goniometer with a copper anode x-ray tube, fixed slits , monochromator and a forty position sample changer allows phase & mineral identification. DiffracPlus with the search/match option is used to collect and analyse the diffraction data. Quantitative XRD Analysis is performed using either DQUANT or SIROQUANT dependent on the material and standards available. Powder XRD is used in many areas where the identification of unknown materials is required; these include geological, environmental, material science, biological and industrial applications. Identification of mineral phases is made by comparison to extensive collections of reference data. For the interpretation of single phase material this process can be relatively simple. However, with increasing phases present this can become more complex, particularly with the overlay of one set of crystal peaks on another. It is often necessary to have element chemistry of the sample in order to refine search patterns (typically at the AAC we will suggest that if the chemistry cannot be supplied that we also perform a semi-quantitative XRF analysis. 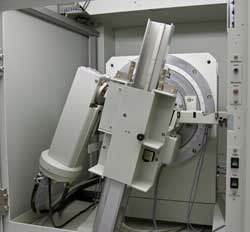 Powder XRD requires the samples be crushed to a fine powder and the grains randomly distributed when presented to the X-ray beam.